CareCenter Ministries of Mountain Home has received a $2,000 grant from the Arvest Foundation. The faith-based organization focuses on transforming the lives of those dealing with addiction and poverty in the Mountain Home area by providing hands-on training and resources to overcome these issues. The funds will be used to purchase hygiene products, bedding and a commercial kitchen sink for the newly opened women's facility. 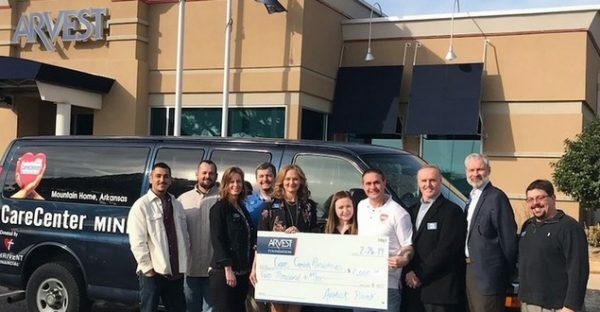 Sally Gilbert, marketing president of Arvest Bank in Mountain Home, says they want to support organizations that help improve the lives of those in the community and CareCenter Ministries is a perfect example. Gilbert says bank officials know helping meet these needs will produce life-long benefits for the community. Ty Cotter, executive director of CareCenter Ministries, says the money is a tremendous blessing to the organization and will help with many long-term needs that will allow them to minister to individuals in the community dealing with serious issues like addiction and poverty.